Seriously? It's the current year! Before buying my Note5, the last Samsung phablet I owned or used was the Note 2. Suffice it to say, the Note 2 TouchWiz experience made me quite weary of Samsung’s offerings. I’ve been an unapologetic Nexus/Motorola fan for a while now. 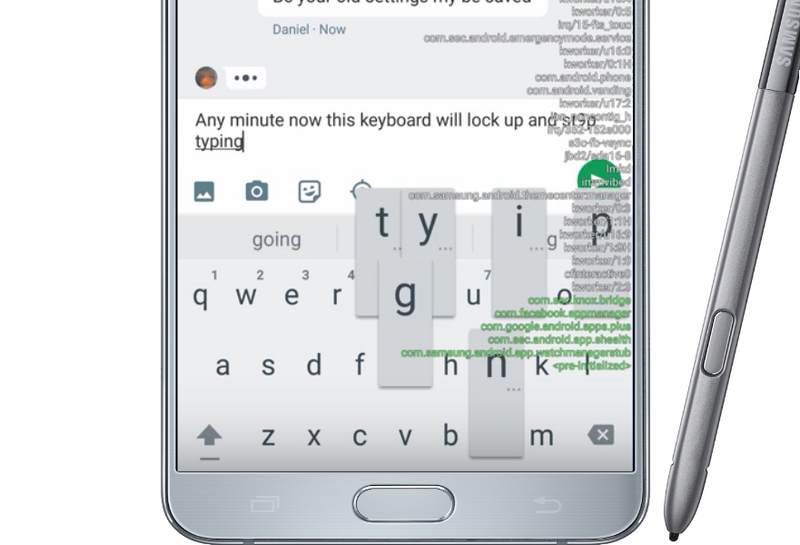 Unsurprisingly, when Samsung announced their new “lighter” version of TouchWiz — I was listening. It seemed that Samsung was finally addressing all the things that I didn’t like: cheap feeling plastic, unabashed feature creep, and an extremely heavy skin. I wound up picking up a Galaxy S6, and later, a Note5. I’m a huge fan of the hardware and build quality of the 2015 Samsung devices. My Note is rock solid with an incredible display and the curved back is just awesomely comfortable. However, I’ve had an extremely annoying issue with the device since day 1 – Lag. Don’t let the “lighter, cleaner, smoother” TouchWiz promises fool you, upon initial boot my T-Mobile Note5 is running around 100 processes. For comparisons sake, my Nexus 6P has around 40 running processes on boot. Essentially, when waking from sleep my Note has a very hard time keeping up with typing, on any keyboard. Eventually it “catches up,” and the input lag is diminished. This has been ongoing and repeatable for me on my Note (Android 5.1.1 with baseband N920TUVS2COKC.) The lag has persisted through a factory reset, several attempts at tracking down rogue processes, and even a device exchange. T-Mobile was quick to send me another device and the issue was present on the replacement device. This likely has to do with the frequency scaling upon wake-up, and it’s odd really, because we didn’t find such stark issues in our full review back in 2015, and I know for a fact that not everyone at the office, or on the internet for that matter, reports the same issues. But many do, and these inconsistencies still give TouchWiz a bad fame, even when Samsung had the clear upper-hand in processing power last year. Despite all of the promises of a much improved software experience, I still find TouchWiz to be grating, heavy, and unnecessary in places. Bloatware remains an obvious, low-hanging problem. Using the ever popular Package Disabler it’s not difficult to easily disable almost hundreds of unwanted Apps and Services. We’re also coming up on 4 months from the release of Marshmallow and the Note5 still doesn’t have it. The Galaxy S6 rollout has been announced, but as usual those of us in the US most likely still have some more waiting to do. I remain hopeful that Marshmallow may help alleviate some of the issues I’m having. In short, Samsung really needs to get its act together for the S7’s release. The fact that the most powerful flagship has given some unlucky users like me keyboard lag, even on the lightest keyboards out there, is unacceptable. Samsung’s TouchWiz has improved over the years, that we can’t deny, but as far as performance goes, it is still playing catch-up. Samsung had the hardware advantage in 2015 to mask TouchWiz’s shortcomings, but with promises of a proper Qualcomm flagship that they themselves are going to utilize, the playing field will be even. If Samsung doesn’t bring forth a truly better TouchWiz – and not merely another incremental step – then I am afraid we may see many enthusiasts lose some of the few hopes they had left, as other flagships run circles around it.